These 99% natural face wipes have a 3 in 1 action to effectively remove makeup, cleanse and moisturise in one easy step. 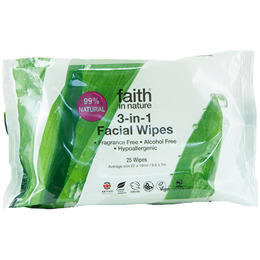 With a gentle hypoallergenic formulation infused with organic aloe vera and chamomile, Faith in Nature`s wipes are suitable for all skin types to instantly and gently refresh skin. Aqua (Water), Propanediol*, Aloe barbadensis leaf juice**, Anthemis nobilis flower extract**, Coco-glucoside*, Sodium levulinate, Sodium benzoate, Potassium sorbate, Citric acid*. Gently wipe over the face and neck to remove makeup, cleanse and moisturise in one easy step. Repeat if required, dispose of used wipe in the bin, do not flush. Ensure pack opening is resealed to prevent drying out. For frequent use, morning and night. If irritation occurs stop use. Below are reviews of Faith in Nature 3-in-1 Facial Wipes - 25 Wipes by bodykind customers. If you have tried this product we'd love to hear what you think so please leave a review. Fab, the best I've tried. Gentle and moisturising. Bought these to replace my high street wipes. I think they're pleasant to use on my face, I'll keep using these once they run out. Excellent facial wipes. Excellent service.